Monday – Friday: Lunch 11 a.m. – 2 p.m. Dinner 5 p.m. – 7:30 p.m.
Saturday: Brunch 11 a.m. – 2 p.m. Dinner 5 p.m. – 7 p.m.
Sunday: Brunch 11 a.m. – 2 p.m. Dinner 5 p.m. – 7:30 p.m.
Meyerhoff House Dining Room caters to the flexible lifestyle of an artist with buffet-style dining and weekend brunch options. 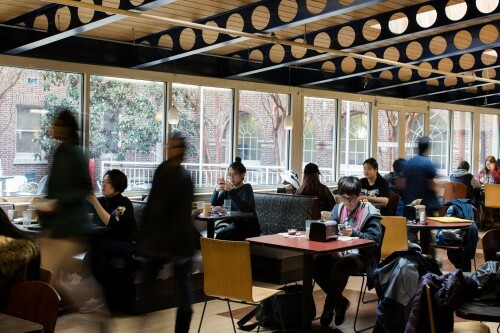 Located on the first floor of Meyerhoff House, it is largest dining facility on campus with buffet-style dining offering a range of options for brunch, lunch and dinner, as well as special events. Meyerhoff Dining Room now features NetNutrition, a program that takes the information of products used and generates nutrition content for the foods served on campus. It's a useful tool to help track the nutrient intake in an easy and friendly way.